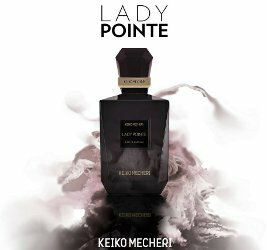 Niche line Keiko Mecheri has launched Lady Pointe, a new unisex fragrance inspired by the ballet and described as "a mood, a stage, a fantasy". Notes for the floral leather scent include citrus, blackcurrant, orchid, suede accord, rose, white musk, tonka bean, patchouli, moss, incense and sandalwood. Keiko Mecheri Lady Pointe is sold in 75 ml Eau de Parfum.